Redshirt junior guard DJ Williams looks to make a pass during a game against Valparaiso earlier this month. Updated: Dec. 29, 2018 at 10:41 a.m.
Men’s basketball (3–9) will return to the Smith Center to take on crosstown opponent American (6–4) in its final tune-up before heading into Atlantic 10 play. Both teams are coming off a full week of rest thanks to the holiday break, but the Eagles most recently thumped Maryland Eastern Shore by more than 20 points while GW fell to Harvard in its last game. The two teams last met a decade ago, when the Colonials came away with a 63–50 victory at the Smith Center. In GW’s last contest against Harvard, the Crimson grabbed 19 offensive rebounds in the game, inhibiting the Colonials’ chances of bringing home a win. The squad struggled on the boards, but it put up promising numbers in other facets of the game. The Colonials finished shooting 46.0 percent from the field, more than four percentage points better than their season average last year. They also shot 40.0 percent from beyond the three-point line, far above their 32.0 percent mark on the season. American has held its opponents to a 39.9 percent shooting clip over the course of the season so far, but in the Eagles’ four losses, their opponents improved to a 42.6 percent shooting average. When American fell to Howard – a team GW beat earlier this month – the Bison shot 57.9 percent from the field. If GW can manage to carry over its improved shooting numbers against American, it will help its cause. The Eagles also have not been strong with offensive rebounds this season, averaging only 8.4 per game. GW has struggled to limit its opponents on the offensive boards this season, letting up an average of 13.0 offensive rebounds per game while only managing 8.9 of its own. The glass has been a problem all season for the Colonials, especially after losing junior forward Arnaldo Toro for the season earlier this month. The Eagles’ deficiency under the glass should help the Colonials get an upper hand that could translate to second-chance points. 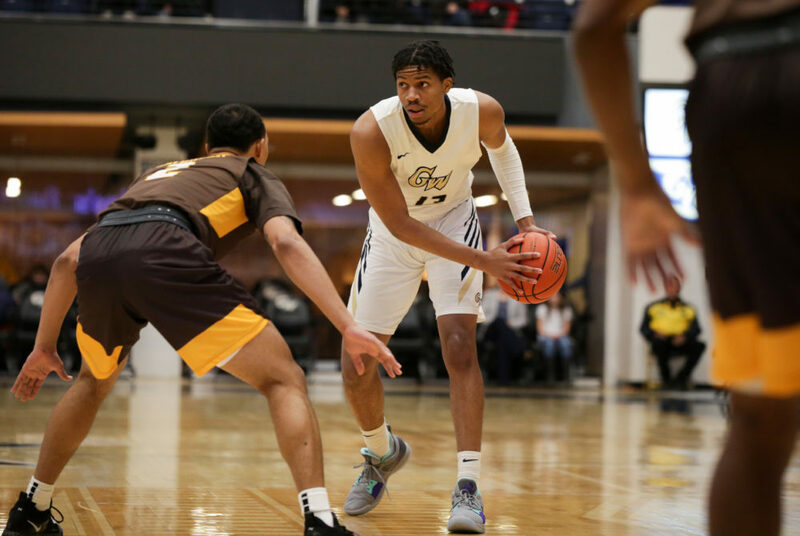 Redshirt junior guard DJ Williams – who leads the team in rebounds behind Toro – will need to lead the charge in limiting second-chance shots for GW. Freshman forward Marcus Littles saw an uptick in minutes last game and although he only grabbed one rebound, his 6-foot-9-inch presence in the paint should help stifle the Eagles’ second-chance attempts. Even in the four games American has lost this year, the Eagles’ contests have been decided by a few baskets. The Eagles have averaged losses of just about five points, including two defeats decided by fewer than two points. Although the Colonials recently gutted out a close contest against Howard on Dec. 14, the team has struggled to finish close games this season. American hasn’t totaled many offensive boards, but it averages 26.7 defensive rebounds per game to bolster its season average to 35.1 rebounds per game. GW has only managed to tally 32.3 boards per game while letting up 38.9, meaning the Eagles will likely have the overall advantage on the glass. Sophomore forward Sam Iorio has been a force for the Eagles, averaging 15.2 points and 7.3 rebounds per game. With no Colonial totaling more than 5.5 rebounds per game, Iorio will likely dominate a small GW lineup. The Eagles have also put up a strong shooting performance through 10 matchups, managing a 46.2 percent average in field goal shooting. If American can string together a solid shooting performance coupled with a strong presence down low, it will likely be too much for the Colonials to overcome. The Colonials are coming off one of their best shooting performances of the year, and will have a shot to beat the Eagles if they can find a rhythm on the floor. But the Eagles have the advantage on the boards – an area that has crippled GW all season long – and have managed to stick with all their opponents, so the Eagles will have an advantage if the contest is close. The Hatchet incorrectly reported that American’s nickname is the Patriots. It is the Eagles. We regret this error.